Most people would probably be surprised to hear that I got a tattoo, but actually I am into tattoos that have a deeper meaning to people. I got mine about a week before Christmas and this was my gift from the Hubs and the kids. The number one question that I get is, “Did it hurt?” Yes, there is pain, but for me it wasn’t pain that was unbearable! It felt more like a burning sensation to me. But I might not be the best judge of pain, I have a high pain tolerance. My Tia will tell you, I had an emergency c-section and was out of the hospital the next day so I could go see my kids, with little to no pain medication. 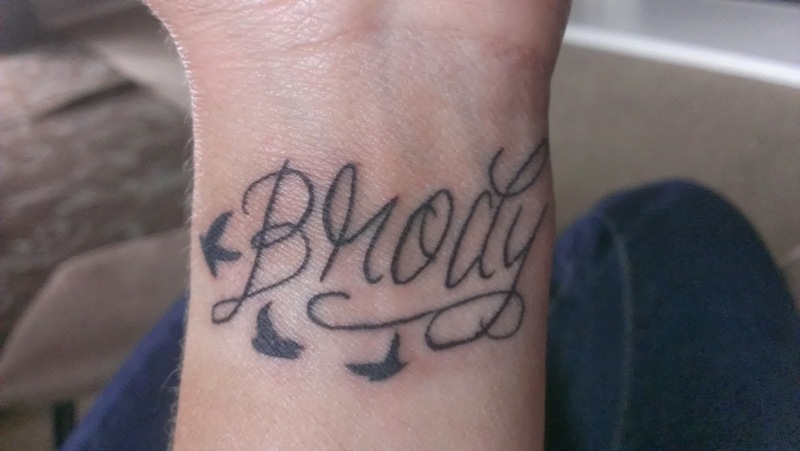 Second question that I get is, “what does it mean?” Brody is my son that passed away, Madison’s twin brother. The three birds are symbolic, they represent my three kids, peace, and freedom of mind and soul. My tattoo artist’s name was Nick, he couldn’t of been nicer, he came recommended from my brother. He wasn’t intimidating, judgmental or unfriendly. I would definitely recommend him! I know this isn’t the best picture, but this is what your tattoo looks like right after your done. It’s red, raised and irritated. The next day it looked like this! Within in a week it was completely healed. And that my friends is my tattoo story! Next Post A VERY PROFOUND VIDEO, MUST SEE!